Wikoff DS, Miller GW. 2018. Systematic reviews in toxicology (Editorial). Toxicol Sci 163(2):335–337. 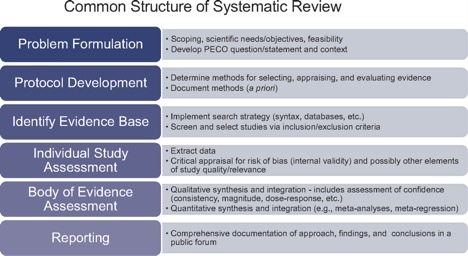 Excerpt: Toxicological Sciences recognizes the role of systematic review in the field of toxicology, as well as the need to adapt and facilitate the conduct and reporting of high quality systematic review. Therefore, we are introducing a new category of manuscripts called Systematic Reviews. These submissions will be handled by a specific associate editor who has the appropriate expertise in the aforementioned areas. Even though the category will be called Systematic Reviews, it will include a variety of submissions that utilize systematic and evidence-based approaches.